Originally known as The Colombian in the 1920s and then as Bon Air in the 1930s, the Chevy Chase name came to existence in 1949. 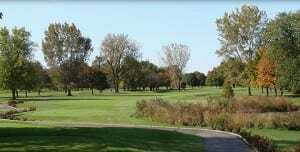 The course was originally built in 1924 by the Knights of Columbus, it’s now known as Traditions at Chevy Chase. Originally designed by legendary golf course architect Thomas Bendelow, Traditions at Chevy Chase was renovated in 2002 by Bob Lohmann. This 18-hole, par 72 course pays homage to the architecture from the origin of the game of golf. The course features deep pot bunkers lined with native fescue grasses, generous rolling greens, and undulating bent-grass fairways. It also offers four sets of tees to challenge players of all skill levels. Located on Milwaukee Avenue in Wheeling, this fantastic club and golf course also offers a grand ball room which has a 5000 sq. foot dance floor and will seat 600 guests. The Gable Room Bar and Grill serves beer and cocktails along with appetizers, sandwiches and burgers. You can get professional private or group lessons here at this picturesque 18 hole golf course. You can expect beauty as well as water hazards and sand traps. Take the time to truly enjoy this course with its sheer perfection.